The biggest problem I’ve always had with “life-sim” games like Farmville, aside from them being plagued with microtransactions and boring gameplay, is that they seem to require so little of the player. A few simple clicks of the mouse, and the game leaves you with exhausted resources, waiting for some arbitrary timer to wear off so you can do it all over again. “What the heck does Farmville have to do with Colossatron?” I picture you asking. 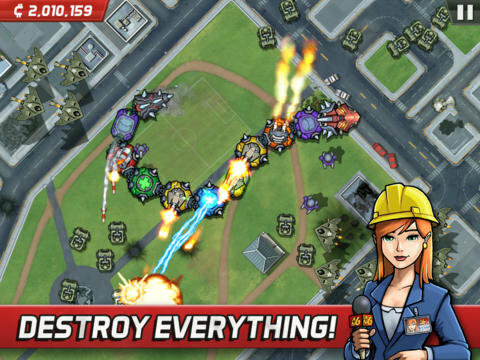 Well, unfortunately, Colossatron: Massive World Threat takes more of its cues from life-sim games than monster rampage adventures. 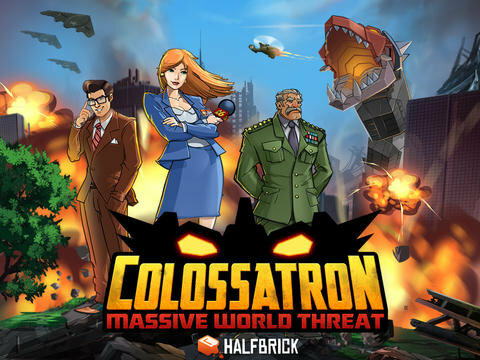 Boiled down to its simplest description, Colossatron: Massive World Threat is a top-down “action” puzzler (I’ll explain those quotation marks in a second). In this title, you “control” a giant robot-snake thing which seems to live only to level human cities and cause as much destruction as possible while the military try to blast it back to its home planet. Just reading the description, you probably think this game sounds a lot like the seriously fun Rampage games of old, or perhaps the more recent mobile release Roar Rampage. I know I sure did, which made what I got in the end product all the more disappointing. The game is broken up into small stages, each one with slightly different scenery for your monster to tear through. 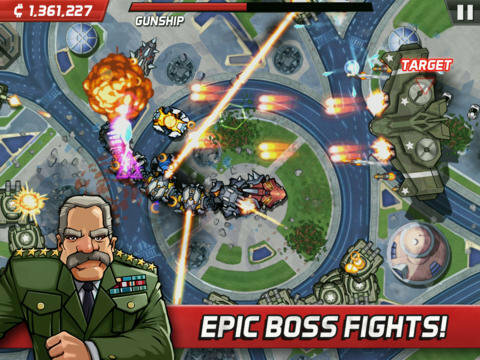 The game takes its focus on destruction to heart, and there are no modes that really deviate from the core gameplay. Each stage plays out the same; Colossatron drops from orbit into the earth below, and the military promptly swarms it in hopes of blowing it up before it does them in. You, the player (this is where the puzzle part of the game comes in) must attach colored “power-nodes” to the metal beast, which increase its firepower and health when matched with corresponding colors. That puzzle mechanic sounds interesting, but therein lies the problem. In introducing that power-node match-three gameplay mechanic, the game strips away all direct control of the monster from the player. And if you’ve played Rampage before, I don’t need to tell you that most of the fun of the game stems from actually punching down buildings with your own thumbs. Imagine a first-person-shooter where you upgrade your soldier’s gun, and then are forced to sit back and watch as he goes off into battle and does all the exciting stuff himself. Sounds boring, right? Well, that pretty much sums up how Colossatron feels. Even the puzzle mechanic itself isn’t that good. Match-three gameplay is old, no doubt about it, and just relegating those puzzles to the length of a robot-lizard doesn’t really give the game the freshness it needs. Also, during those late stages when the army is absolutely drowning you in infantry and vehicles, it’s hard to see your monster’s snake body underneath the mess, which makes it harder to properly attach power nodes the way you want to. Also, surprisingly, a game which already has an entry fee (was 99¢ at time of review) has microtransactions which allow players to unlock various power-node types, and armor upgrades. Seeing as this is a puzzle game, shouldn’t players be forced to rely on their own skill? But I digress. If nothing else, the game looks good, and control wise, there’s nothing bad to note (though there’s nothing good to note either). Colossatron: Massive World Threat tries to grab the player with a semi-interesting mechanic, but in the process strips all the fun out of the game by removing direct player control. If rampaging through cities is boring, the game is doing something wrong. It’s during those times when there’s tons of bullets flying and explosions on screen that you really wish you could actually participate in all that action, instead of being a bored bystander.